Updated: Now that I’ve been making these for a year or so, I’ve made a few small changes below. If you ever want to start an argument in a room full of chefs, just mention that you make your biscuits with water instead of milk. If you want to avoid that sort of public affray, however, but still get some varying points of view, simply browse through a few thousand of the most common biscuit recipes on the Internet. I set out a few weeks ago to teach myself how to bake biscuits. I grew up with my mother making dry, “hockey puck” style pastries, but my grandmother’s were superb. I started with Sam Sifton’s classic recipe in the NY Times. For a more scientific approach, however, check out this Instructable on the science of biscuits. It helped me confirm that there were a lot of unproven myths about biscuits that can be safely ignored. For example, you can make biscuits with water instead of milk (or buttermilk, or heavy cream) and most people can’t tell the difference. You can knead them a lot and it won’t make too much of a difference (though why risk it?). And both butter and shortening will turn out well. It seems to make more of a difference how thick you roll them (we’ve found that 1” or more makes a better biscuit). And I’ve discovered, quite by accident, that leaving out the salt is not good at all. 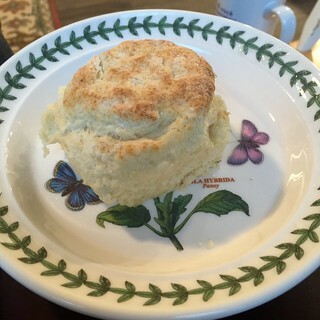 In England, scones are much like (southern) American biscuits, except that they tend to be sweeter (and they’re usually served cold instead of hot). To make English-style scones, add some extra sugar to the dough and use heavy cream instead of milk. (You can also replace the butter with cream cheese.) Here’s another opinionated NY Times receipt for biscuits and scones. You can find baking powder without aluminimum, which seems to add a bitter taste. I’ve taken to using Argo, and I get good results. Mix the dry ingredients. You can use a fork, a food processor, a sifter, and, honestly, it doesn’t really matter. Just don’t forget the salt, or you’ll regret it. Add the liquid. You can reduce the amount of liquid to as little as ½ cup without too much problem, and I recommend doing this if the dough comes out very sticky. I just use a spoon and mix everything together, then turn it onto a floured tea cloth (or cloth napkin) to knead. Add more liquid if it’s too dry and falls apart; add more flour if it’s too sticky. You may have to adjust based on the ambient humidity. Squeeze the dough together and knead it a few times. I tried using a roller, but found that it’s not really necessary. Just pat it down until it’s about 1” thick. The NY Times article recommends letting it sit for 30 minutes, but I haven’t found that that makes any difference at all, and I’m not sure what that’s supposed to do except make you hungrier. Add more flour if it sticks to the tea cloth, and use the cloth to fold the dough over itself a few times; this will add layers to the biscuits and help them to be more flaky. Cut the biscuits; I use a round cookie/biscuit cutter, but cutting them into squares may help reduce the amount of leftover dough that has to be re-kneaded and re-cut. I’ve always been told to never twist the cutter when cutting them, as it can pinch the edges together and prevent them from rising. Arrange the biscuits on the baking sheet. Make sure they’re all touching, and all the leavening will force them to rise up rather than out, which helps them to be flaky. Bake them for 15 minutes, or until they’re brown enough for you. Brush with butter as they’re baking to help get a golden top.